Traditionally a new year is started from the North American Auto Show runs from January, 14 in Detroit. The history of Detroit Auto shows is over a hundred years, and the place of shows is not chosen accidentally, because there are headquarters of “the big 3” American manufacturers: Chrysler, Ford and General Motors. This year the motor show will be held from 14 to 27th of January, and the number of presentations will reach fifty. 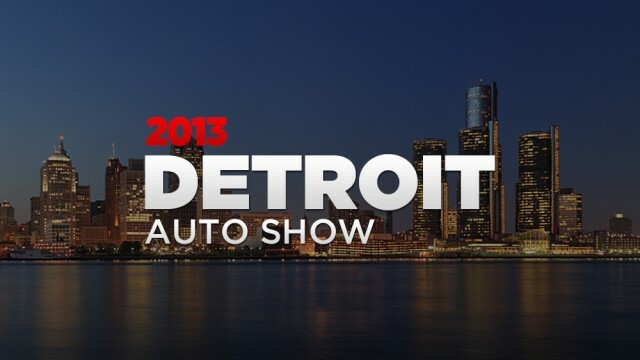 We would like to represent 10 of the most interesting vehicles of Detroit Auto Show 2013. One of the main events of Detroit Auto Show was the presentation of the new generation of the legendary sport car Chevrolet Corvette. The first model was presented to the public nearby half a century ago, in 1953, and this model is the seventh. Owing to aluminum and carbon fiber, the designers of the new "Corvette" reduced the weight of a vehicle but increased the rigidity of the body. The sport car will be equipped with 6.2-liter engine producing the output of 450 hp and a seven-speed manual gearbox. The new Corvette will speed up to 100 km/h for just 4 seconds. The digital dashboard of a sport car will vary with modes and its data can be projected onto the windshield. Sales of the new Chevrolet Corvette will begin at the end of 2013. The Italian automaker Maserati has already presented the sixth generation of luxury sedans Quattroporte in Detroit. The new vehicle was designed by Maserati Centro Stile under the leadership of Marco Tenkone, who named the sedan style as “simple and pure”. The sixth Quattroporte is bigger than its predecessor, as well as more powerful and dynamic. The vehicles will be equipped with two types of engines: a 3-liter V6 engine with the output of 410 hp and a 3.8-liter V8 engine with the output of 530 hp. Motors assembly will be made by the Ferrari factory in Maranello, and these motors will work with an automatic transmission. The maximum speed of the first engine will be 285 km/h, and the second - 307 km/h. The main competitors of updated Maserati Quattroporte will be BMW 7-Series and Mercedes S-Class. Firstly the Cadillac representatives noticed about the construction of the hybrid coupe in 2009, when a concept car Converj was presented to the public. But financial difficulties prevented to bring the sample to a production line. It took four years to complete the car and introduce a production vehicle in Detroit. The new two-door vehicle was called ELR and became the first hybrid sedan of the production. The car was based on the Chevrolet Volt. Cadillac ELR hybrid is equipped with an electric motor, gasoline engine-generator and lithium-ion batteries. The first source of energy is the electricity that drives a coupe without gasoline but with minimal harmful emissions. When the battery is low Cadillac ELR will switch on the mode of the gasoline engine. The Italian supercar manufacturer prepared the super new vehicle is the double-seater F70 positioned as the successor of Enzo. The monocoque designed by engineers of Formula 1, was presented last autumn at the Paris Motor Show, and now it is the turn of production cars. The body of two-door sports car is made of carbon fiber that is why the new model is easier than Ferrari Enzo. The car can get a hybrid propulsion, consisting of a 6.3-liter gasoline engine and electric motor, and the total output is 900 hp. And Ferrari F70 can speed up to 100km/h for 2.5 seconds, and the high speed is to 400 km/h. A number of features can be controlled on a multi-functional steering wheel. The expected cost of the supercar will be € 800 000. The Mercedes Concern will present a new class of sedans in Detroit. And the first vehicle will be a compact Mercedes CLA, based on the A-class models. Germans concealed the exterior of vehicle but released a number of its technical characteristics. The sedans will be equipped with three types of gasoline engines of the output from122 to 211 hp. Also constructors are going to equip the car with diesel engines. Mercedes CLA will have the front-wheel and the all-wheel drives, as well as the manual and automatic transmissions. The price will be announced at the Detroit Motor Show, but according to unofficial information in Europe the cost of the compact sedan can be from € 28,000. The new Mercedes CLA has no competitors, because the automarket does not produce this class of vehicles. 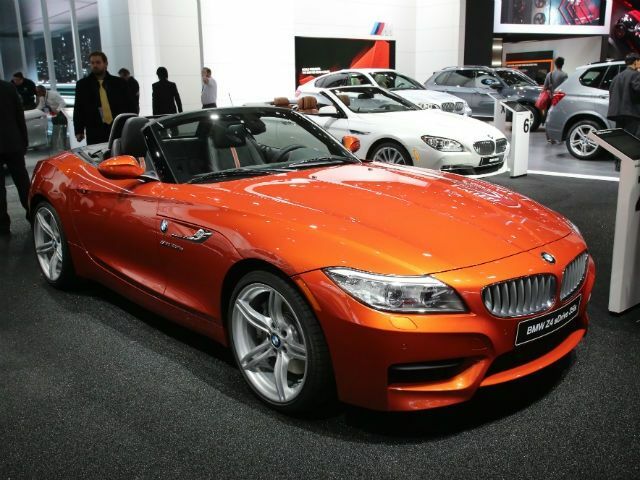 The good Bavarians tradition is to present updated versions of Z4 roadster in Detroit. Here in 2009 the second generation of sport car was presented and four years later the Germans brought the third modification of the model to Motor Show. The exterior and interior of the updated Roadster were not changed except the headlights that were made of LED and the new alloy wheels. The new 2-liter gasoline engine with the output of 156 hp will speed up the roadster to 100 km/h for 7.9 seconds and to a maximum speed of 221 km/h. All engines will work with a manual or automatic transmission. An updated BMW Z4 Roadster will be on sale in the spring. 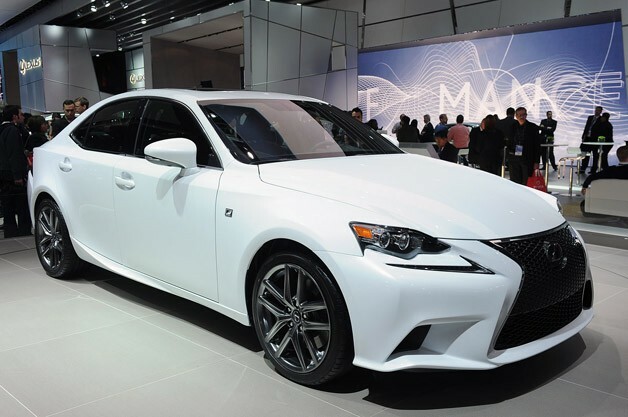 The main new vehicle of Lexus is the next generation luxury sedan IS in Detroit. There are noticeable external differences from the previous two modifications of the model. The third generation of Lexus IS received a new grille of an hourglass shape that was designed on the concept car LF-CC at first time and now will be placed on all new vehicles of the Japanese brand. In addition, the sedan has narrow diode headlights and undulating thresholds. The car exterior became impressive and aggressive. Lexus IS will be equipped with a 2.5 and 3.5-liter V6 gasoline engines with an eight-speed automatic transmission. In the future the Lexus company is planning to produce a hybrid model of the sedan. This vehicle will be on sale in the second half of 2013. The concern Bentley presented the special new vehicle at the Detroit auto show. 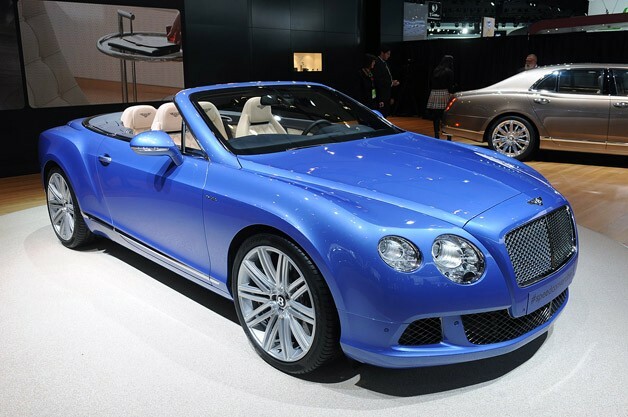 The four-door Bentley GTC Speed is the fastest car in the world today. It speeds up to 100 km/h for 4.4 seconds and to the high speed of 325 km/h owing to the 6-liter gasoline engine producing 625 hp and an eight-speed automatic transmission. Of course, the cabriolet Bentley GTC Speed is not only fast and powerful but also extremely comfortable and luxurious car. Hand-made trim of the car consists of perforated leather inserts of all seats, door trims and rear pillars. The four-layer roof can hold a comfortable temperature inside the car in any weather, the driver and passengers seats are equipped with the option heating neck for the maximum comfort. The Infinity company presented its new vehicle Q50 at Detroit Motor Show. Manufacturers planned to introduce the new model only at the March Geneva Motor Show, but then the company decided not to wait till the spring. And it seems that Infinity tried to bring a car to the market as soon as possible. The model Q50 that was designed as the sedan became the first Japanese car named by a new lettering. By the beginning of 2014 Infinity will abandon the usual prefixes FX, EX and G and replace them with Q and QX. It is expected that Q50 will replace the G37 sedan and become its next generation. According to the published teaser, the new vehicle will differ in the aggressive exterior and LED headlights. In 1992 Chrysler presented the SUV Jeep Grand Cherokee at the Detroit Motor Show. And 21 years later the American automaker will show the fifth generation of the legendary Jeep at the same motor show. The redesigned Grand Cherokee got LED headlights and an updated grille. In addition, the model is equipped with an eight-speed automatic transmission ZF. The customers still can buy both the gasoline and diesel engines with the output from 190 to 468 hp. There is no doubt that the updated Grand Cherokee will be popular. Last year over 700 000 Jeep were sold in the world. Ford Atlas was called the most important new vehicle of Detroit Motor Show 2013. According to Autoweek the most important vehicle of the North American International Auto Show 2013 was the concept Ford Atlas. “The concept Atlas is the most significant new product of the exhibitions, due to its characteristics such as improved aerodynamics and the weight reduction that help improve fuel economy of the pickup. And a next-generation EcoBoost engine using technologies such as engine start-stop also confirms the new vehicle is ready to change the game rules”- Autoweek explained. The concept pickup Ford Atlas eventually will be as the basis for the production Ford F-150. Considering that F-150 is still the most popular car in the U.S.A. And the awarded title of Atlas by Autoweek is also justified.